Once the build is complete, OpenLiteSpeed automatically copies the PHP executable to $SERVER_ROOT/fcgi-bin? and creates a new $SERVER_ROOT/fcgi-bin/lsphp5 symlinked to the new PHP executable. 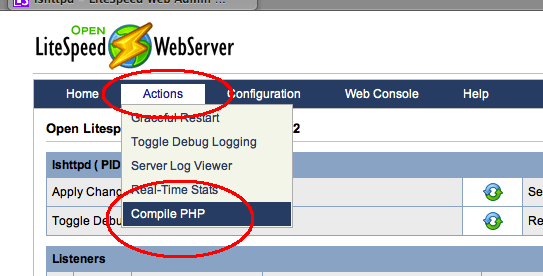 This is done because the default PHP external application is set to read from $SERVER_ROOT/fcgi-bin/lsphp5. By using these symlinks instead of overwriting, our new build is automatically used by the default external applications and we do not have to change the location specified in the External Application settings, but we are still able to quickly revert back to our previous build (just change the symlink) if something goes wrong. You can run the ./lsphp5 -v command to see the new version number.